Laframboise claims that “experts” with alternative views on climate change have been left out of the IPCC process. She cites Nils-Axel Morner as evidence of this, a former president of the Commission on Sea Level Change, which was once a project of the International Union of Quartenary Research, an organisation consisting of scientists from across the world studying the climate going back two million years. Needless to say, Morner claims there’s no link between climate change and sea levels. In her book, Laframboise quotes Morner as saying there is a “disparity between what genuine sea level specialists think and what those who write IPCC reports believe”. The impression left is that Morner is representative of “genuine sea level specialists”. He is not. What does INQUA make of Morner’s position? In 2004, the union’s then president John Clague wrote a letter to the Russian Academy of Sciences which had hosted an event where Morner had given a presentation. Mr Clague wrote that Morner had “misrepresented his position with INQUA”, as the commission which Axel-Morner had been president of had terminated the previous year. Dr. Mörner currently has no formal position in INQUA, and I am distressed that he continues to represent himself in his former capacity. Further, INQUA, which is an umbrella organization for hundreds of researchers knowledgeable about past climate, does not subscribe to Mörner’s position on climate change. Nearly all of these researchers agree that humans are modifying Earth’s climate, a position diametrically opposed to Dr. Mörner’s point of view. Dr Morner’s views concerning sea-level change are his own and are not endorsed by the current Executive Committee of INQUA, nor have previous INQUA Executive Committees endorsed Dr Morner’s views. On several occasions INQUA has requested of Dr Morner that he not inadvertently represent his views on sea-level change as if they have some connection with INQUA. Even after these two incidents, Morner has continued to misrepresent the view of INQUA. Last year, he wrote for The Spectator that the organisation’s research was an “inconvenient truth” for the climate lobby, while the organisation itself says human caused climate change is real and that “Every year, many millions of people will be forced from their land and homes due to sea-level rise“. Laframboise doesn’t mention any of this in her book. Nor does she mention that Dr Morner believes you can find water underground by using a stick. That’s right, he’s a water diviner. 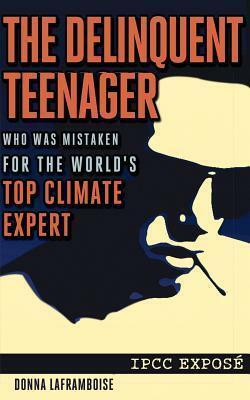 Laframboise’s book pours scorn on the IPCC for choosing the occasional young scientist to carry out tasks as authors. So Laframboise is comfortable with the authority of the 74-year-old water diviner Morner, but not comfortable with the IPCC occasionally using some of the world’s brightest young scientific minds. When Fox News based an IPCC “expose” on Laframboise’s book, Media Matters found that when it came to issues on the qualifications of the handful of young scientists, key facts had been missed or omitted. In a televised interview with Australian climate science sceptic columnist Andrew Bolt, Laframboise speculates that some IPCC authors were chosen because they agreed with the orthodoxy, rather than because they might be good at their jobs. People were chosen because they could be easily led… perhaps because they had already expressed the kind of opinion the IPCC brass was hoping the report would express. It’s not clear but it certainly looks fishy. Yet if this really was the conspiracy to keep out dissenting voices which Laframboise hints at, then how does she explain the presence of well known climate science sceptics such as William Kininmonth, Ross McKitrick and Stephen McIntyre who were all given roles as “expert reviewers” in the last IPCC report? Laframboise’s book also hints at a conspiracy because she found some authors of IPCC reports have affiliations or histories with environment groups. In one case, Laframboise accuses the IPCC of committing a “sin of omission” by neglecting to point out that William Hare, a visiting scientist at the Potsdam Institute, has strong ties to Greenpeace. Why did Laframboise go looking for scientists with links to environment groups while ignoring, for example, the presence of a “Haroon Kheshgi” from the “ExxonMobil Research and Engineering Company” or that oil company’s many other contributions to IPCC reports? No mention either in her book of Ross McKitrick’s position as senior fellow of free market think-tank The Fraser Institute, or William Kininmonth’s roles as an advisor for several climate sceptic groups. She describes Steve McIntyre as a “Canadian with a Masters degree in mathematics and a flair for statistics” but doesn’t mention his 30-year career in the mining industry. Would all of these examples qualify for a Laframboise “sin of omission”, perhaps? In the book, Laframboise writes that she sent draft copies to some “wonderful people” for comments. Sceptics Ross McKitrick, the IPA’s science fellow Professor Bob Carter and recent IPA invitee James Delingpole were among her list of reviewers. Had she sent the book to Professor Roger Jones at Australia’s Victoria University, she may have received a different response. Jones was a Convening Lead Author for the 2007 IPCC assessment report and is a Convening Lead Author for the IPCC’s next main report. He was also a lead author on the 2001 Third Assessment Report. In a post on Jones’ Understanding Climate Risk blog, he pulls apart Laframboise’s claims as being invalid, although he’s not quite that polite. Apparently the selection of a few lead authors who are not hoary old farts who have gone emeritus, disqualifies the IPCC from saying anything useful…. all the young authors that Laframboise picked on have made sustained and substantial contributions since their first efforts on the IPCC. The epic fail in Laframboise’ case is that there is no credible alternative scholarship that exists to counter the sustained and substantive findings of the IPCC. If the IPCC has failings, it is in framing the science-policy relationship (which is also improving substantially), but there are no alternative facts to the science that the IPCC assesses and summarises in their conclusions. Jones then puts his mind to the involvement of the IPA, an organisation which does not reveal its funders (but which is engaged in a project with the world’s richest woman, mining magnate Gina Rinehart). Jones publishes an excerpt of a letter sent by the think tank’s executive director John Roskam, which states that the IPCC had produced “corrupt science”. Roskam is also on the editorial board of Connor Court, which is adding Laframboise’s effort to a string of climate science contrarian books it has already published. All this appears to have been the final straw for Jones. The IPA is anti-science and consequently a risk to society. That is quite clear. They need to be opposed at every turn. Laframboise is just the latest in a long string of climate change science contrarians which the IPA has supported by organising book and speaking tours and visiting lectures. Their record goes back to at least 1991, when the Melbourne-based think tank hosted US-based sceptic Fred Singer. Since then, the IPA has hosted a string of climate science “sceptics”, including Australia’s own Professor Bob Carter and Professor Ian Plimer, UK columnist James Delingpole, Czech Republic President Vaclav Klaus, the US-based Cato Institute’s Pat Michaels and former UK chancellor Lord Nigel Lawson, who is the chairman of the London-based Global Warming Policy Foundation. The IPA consistently seeks out and supports climate science denial wherever it might exist on the planet. Genuine working climate scientists are just not their thing. You could almost imagine such think tanks might have an actual organised program to bring climate sceptics to Australia – perhaps a Climate Science Denier Visitor Scheme? ‘Laframboise’s trip has been organised by free market think tank the Institute of Public Affairs, which has a long history of promoting doubt about the science of human-caused climate change and the risks of the unmitigated burning of fossil fuels.’ – article above. We can’t have doubt, now can we? That might be dangerous. People might begin to develop heretical ideas, like the (obviously diabolical) notion that the sun may actually influence the climate of Earth to a greater degree than we pesky humans ever could. Hey,I missed this article…a bit like Australia ignored La Framboise’s visit. Well written! I must say her work is very shoddy,having read some excerpts. It is simplistic,accusatory and full of conspiratorial ideation,and of no use as any sort of critique,certainly not a scientific one.